J. Danielle Carr, director of professional development and inclusion at Greensfelder, was selected as one of three 2015 Excellence in Business Performance Award winners from the St. Louis American Foundation. Carr was honored Nov. 20 at an awards luncheon at the Four Seasons Hotel in St. Louis. 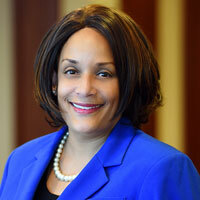 At Greensfelder, she is responsible for cultivating a diverse and inclusive workforce, as well as activities relating to attorney development and training. She is a member of the firm's Diversity & Inclusion Committee, Recruiting Committee and multiple firm professional development committees. Read the St. Louis American’s profile here. For more on Greensfelder’s diversity and professional development initiatives, click here.